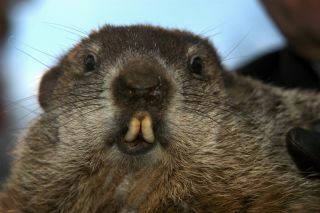 Punxsutawney Phil, the weather-predicting groundhog. As most weather-minded people know, today (Feb. 2) is Groundhog Day. According to folklore, if it is cloudy when a groundhog emerges from its burrow on this day, the creature will leave the burrow, signifying that winter will soon end. If, on the other hand, it is sunny, the groundhog will supposedly see its shadow and retreat back into its burrow, and winter will continue for six more weeks. But in actuality, winter's midpoint will occur on Saturday (Feb. 4) at 12:22 p.m. EST. Although the altitude of the sun has been slowly climbing and the length of daylight has been increasing since the winter solstice on Dec. 22, any changes up to this point have been relatively subtle. For example: On the first day of winter in Boston, sunset occurred at 4:15 p.m. local time, and the length of daylight (from sunrise to sunset) reached a minimum of 9 hours and 5 minutes. On Saturday — winter's midpoint — the sun will set at 5:01 p.m. with only 61 additional minutes of daylight having accumulated since Dec. 22. But as an old, and true, New England proverb notes, "As the days lengthen, the cold strengthens." And as most people who live in the United States, southern Canada and much of Europe will attest, this particular winter season, the thermometer appears to be reluctant to respond to the increasing solar altitude. Indeed, the nearly extra hour of daylight is not enough to give us any sense of warmth; while the days have gradually become longer, the bitterness of winter with its attendant ice and snow is still the same. However, it is in the second half of winter that the effects of the northward shift of the sun's direct rays start becoming much more noticeable. In fact, by March 20, the date of the vernal equinox, the length of daylight will have increased by 2 hours and 5 minutes since Feb. 4. And because daylight saving time begins on March 11 this year, by March 20 the sun will be setting just a few minutes shy of 7 p.m.
Interestingly, for many northern locales, long-term records indicate the first four days of February are the coldest of the winter. But average daily temperatures rise rapidly thereafter, so that by the last week of the month they are higher than any day in January. Meteorologists, in fact, consider the winter season to be over at the end of February; they think of "meteorological winter" as defined by the three coldest months of the year: December, January and February. So for all those winter-weary souls, take heart: In the days and weeks to come, you'll more readily be able to sense the greater amounts of daily light and see the more northerly position of the afternoon sunsets on the horizon. And soon the weather will correspondingly respond as well. So, take heed that while Saturday marks the halfway point of winter, that we're also about to turn the corner, so to speak, both astronomically and meteorologically. And regardless of what your local groundhog or woodchuck might say today, spring is well on its way.